One of India's most eminent historians died two days back at the ripe old age of 86. Bipan Chandra was a tall figure in the galxy of state sponsored historians who set about to create a usuable and politicall correct version of India's violent and tortution path to temporary nationhood. As a professional historian he devoted his entire carreer to Modern Indian History, a field of inquiry roughly overlapping with the rise of the Indian National Congress to prominence in the second decade of the last century. His historiographical ouerve was dedicated to a number of what I call Grand Abstractions: Economic Nationalism, Indian Nationalism,Working Class Consciousness, Communalism, Protest Movements etc. Unfortunately the real history has an uncanny ability to escape from these procrustena beds and we are left with historical narratives in which these Grand Absctrations replace the real life individuals and real life situations. The ability to smell human flesh like the ogre in the fairy tale Jack and the Bean Stalk is the hall mark of the truly great historian. Unfortunatley, Bipan Chandra was content with the march of these metaphors, grand abstractions, if you will, and there by hangs a tale. created the narrative of Communalism as the main force behind the drift toward Partition. In this narrative there was no place for honest intropection of what went wrong: Congress decision to dishonour its Pact with the Muslim League, the decision to walk out of the Governments formed under the Government of India Act of 1935 and most important of all the decision to launch the Quit India Movement in 1942. These steps towards Independence were also giant steps towards Partition and historians like Bipan Chandra were keen to highlight one side of the story which inevitable served the political needs of the nascent Indian nationa state and the ideological needs of the Indian National Congress. As a historian he should have drawn attention to the fact that the Congress Party membership largely excluded the muslims and as Perry Anderson has observed, less than 2% of the membership came from the Muslim populations of United Provinces. 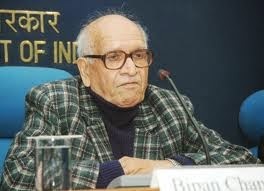 Bipan Chandra was by all accounts a well respected teacher and his Ph D scholsrs virtually adore him. This is truly a testimony to the affection and esteem he commanded in the field. He held several high positions and was one of the few historians to be honoured with the Padma Bhushan. His death is a loss and even those who did not agree with him like this blogger will mourn his loss as all of ius like to quarrel with his intellectual output.